This article is about Airport Station of the MTR. 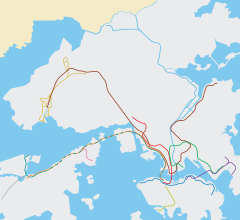 For the line, see Airport Express (MTR). Airport (Chinese: 機場; Cantonese Yale: Gēichèung) is a rapid transit station on the Airport Express of Hong Kong's MTR system. It serves the Hong Kong International Airport, and is integrated with the passenger terminal. The station was opened in July 1998 at the same time as the airport, and served as the western terminus station of the line until the opening of the AsiaWorld-Expo station on 20 December 2005. It is also the westernmost railway station in Hong Kong. Platform 3 was constructed opposite to platform 1 to enable access to SkyPlaza and Terminal 2. The new platform began operations on 28 February 2007, when the additional check-in facilities opened at Terminal 2. Airport Express trains stopping at the station now opens its two doors simultaneously for both platforms—doors on the left open for Terminal 1, and doors on the right open for Terminal 2 and SkyPlaza. Due to the integration with the airport, no exit or entry gates are installed for the convenience of the travellers. Therefore, travellers can walk straight into the terminal building through the exit for their check-in procedures (if they have not completed In-Town Check-in). Ticket baskets are provided on the departure level for the travellers to dispose of their used tickets in. A souvenir shop is also found there. Although no entry gates are provided at Airport Station, travellers must still buy tickets from the ticket machines located in the Arrivals Hall or on platform 1 of the Airport Station before boarding the train. Otherwise, they may not be able to get out through the exit gates at AsiaWorld–Expo, Tsing Yi, Kowloon or Hong Kong stations. Travellers who arrive at the Airport can immediately enter the terminal with any baggage they have and walk into the passenger terminal. No exit gates are provided. Wikimedia Commons has media related to Airport Station (MTR). ^ MTR (27 February 2007). "Airport Station New Platform Opens for Operation" (PDF) (Press release). ^ a b c "Airport Station layout" (PDF). MTR Corporation. Retrieved 18 February 2015.